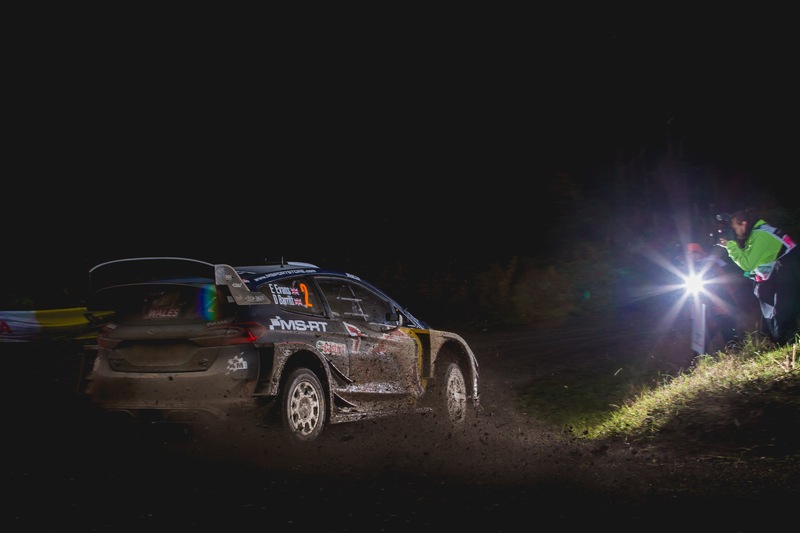 A misfire has cost Elfyn Evans all hopes of winning this year’s Wales Rally GB. An engine misfire has put Elfyn Evans out of the Dayinsure Wales Rally GB. The Dolgellau driver was a superb second, just 8.9 seconds behind Ott Tänak, when he drove out of midday service in Deeside and headed for the first of this afternoon’s three forestry stages. But he never reached Clocaenog. On the A494 near Mold, a misfire stopped his M-Sport Ford Fiesta WRC, with flames reportedly coming out of the exhaust and setting the car’s rear bodywork on fire. Evans, an accomplished mechanic, did all he could to fix the problem – but with just 30 minutes of maximum lateness allowed, the clock eventually beat him and co-driver Dan Barritt. If the car can be repaired, Evans will return tomorrow under the Rally 2 regulations, albeit with considerable time penalties for missing three stages. His hopes of a back-to-back Wales Rally GB victory is sadly over. It wasn’t a great day for the M-Sport team. Sébastien Ogier lost time in the morning with gearbox problems, and Teemu Suninen put his Fiesta WRC off the road on today’s final stage. It has, however, been a very good day for Ott Tänak. The Toyota driver, who has won the last three World Championship rallies, took the lead on today’s opening stage and, thanks to Evans’ retirement, ended the day with a 28.8 second advantage. Despite the disadvantage of running first on the slippery gravel roads, World Championship leader Thierry Neuville holds second tonight. He’s in a big battle for position with Jari-Matti Latvala, who lost a chunk of time on the second run through Brenig when he hit a stone and broke the windscreen. Tom Cave is having a fantastic run in his Hyundai i20 R5. Co-driven by Hirwaun’s James Morgan, the 26-year old driver from Aberdovey is a magnificent 13th overall. Tomorrow’s leg is the longest of the event, with nine stages totaling 93 stage miles in the classic mid-Wales forests of Myherin, Sweet Lamb, Hafren, Dyfi, Gartheiniog and Dyfnant. To make it harder, there is no service during the day, only a lunchtime tyre fitting zone in Newtown. Neil Warnock . . .Two Years And Counting At Cardiff City, But Is This The Beginning Of The End?